Driving a convertible can be one of the greatest pleasures imaginable for the discerning car lover. Convertibles offer a unique experience, especially when one drives with the top down. Yet car lovers know that the top can't be down all the time - and, for many convertible owners, therein lies the problem! Convertibles require special care in order to look and perform their best, and that includes carefully protecting and maintaining the convertible top. First, determine whether or not your convertible top is fabric (i.e. canvas) or vinyl. There is a difference in caring for these two materials, so you'll need to know what you're dealing with in the first place. Keep in mind that fabric tops are not waterproof, so they will need to be sprayed with a special waterproofing protectant in order to shield them from water damage and prevent them from leaking. Never use the following substances on your convertible top: Bleach, ammonia, vinegar, alcohol, detergents and acids. Any products that contain these ingredients can erode the material of your convertible top, or leave it dried out, clouded or discolored. Only use cleaning agents and protectants made especially for convertible tops. Take the time to regularly rinse your soft top with water. This will prevent buildup and keep it clean from dust, leaves and other everyday items. Use a special cleaning product suitable for your convertible top to thoroughly clean the fabric or vinyl every six to eight weeks (for fabric) or every four to five weeks (for vinyl). Follow the instructions on the bottle and use a soft bristle brush rather than a rag or sponge. Always clean the entire top rather than spot cleaning to avoid partial discoloration. After cleaning, dry thoroughly with a microfiber towel, then follow up with a special soft top protectant. Follow the instructions; you may need to spray on more than one coat. Always let the protective agent dry completely between coats. Whenever possible, park your convertible in a covered garage, rather than leaving it outside where it will be vulnerable to weather and the elements. For more information on maintaining and cleaning your convertible top, check out the video in this article, or contact your dealership or a qualified auto mechanic. 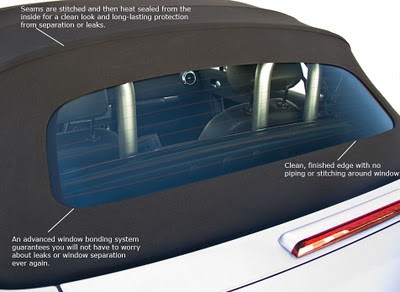 If your top is torn, leaking, or the window is broken or the seal is no longer holding together, than the only long term solution is to replace the convertible top. Rear windows have always been an important part of the convertible's aesthetic. They're smaller than a regular car rear view because they need to fold nicely into the trunk, but this actually adds to the sleek sporty appearance of the car. 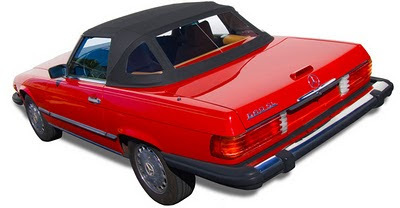 As with any other car part, there have been some incredible advances in the convertible rear window since the first convertible cars were produced. The windows started out as being a piece of clear plastic that was sewn or zippered on to the canvas or vinyl top and then evolved into tougher more translucent plastics or glass. Recently glass rear view windows have gained popularity because they have a longer life span than the plastic window, which tends to discolor or get damaged easily. However, the glass window required a little more thought in the manufacturing process because it could not be sewn or zippered on to the convertible top's fabric. Car companies quickly solved the problem by creating a unique window bonding process that would maintain the vehicles sleek exterior. Aftermarket companies found ways to try and replicate the process as they did with the plastic windows. In the beginning, the easiest way was to apply silicon around the edges of the windows, pressing down with wood vices until the glass adhered to the fabric. This process was easy enough to achieve and required no special tools. However, the problem that arose was that the seals would not prevent leaks adequately as separation would commonly occur. The industry was forced to look into other options that would maintain the sleekness of the vehicle as well at the durability of the seal. This led to a new process which required a heat-seal between the glass and the fabric. It would generally work that a piping which would hold the glass in place would be sealed or stitched to the fabric, and then heat-sealed to the glass. 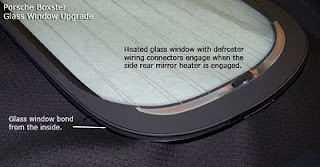 This solved the problem of leakage, but still could not compare to the OEM (original equipment manufacturer) look; the glass would not be flush from the inside because the piping that was connecting it to the fabric would run around the outer rim of the window as well. Companies have tried to mimic the factory direct look, but at the end of the day, only a proprietary window bonding technique could be equivalent to the manufacturer. This is why advanced window bonding system is, in our opinion, the best way for aftermarket convertible top company to eliminate all the problems that the other techniques have, while also creating a top with an OEM finish. When deciding what replacement convertible top to choose, make sure the company only deals with specialty rear view windows that have the most authentic appearance.